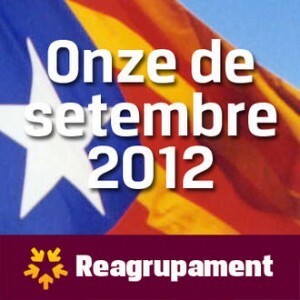 Reagrupament Independentista (RCAT) centralize all their September, 11th actions in Catalonia’s National Capital, Barcelona, because we want to help make the event this year as huge as possible, and RCAT is unequivocally in favor of the independence of the Catalan nation. However, we insist, as we have done on other occasions, that the mobilization on the street, although important because it demonstrates that the desire for independence is growing within the broader society, is not sufficient to achieve statehood. In this regard, we reiterate that the independence movement will achieve its goals only when the institutions are governed by political parties which have the independence of the Catalan nation as their primary objective and when in the Parliament of Catalonia there is a majority of parliamentarians willing to proclaim independence. This is why we insist that the way to our sovereignty is to proclaim the Unilateral Declaration of Independence (UDI) by the Parliament of Catalonia. A statement that would open the process of rupture with Spain in the autonomous community of Catalonia (open to the inclusion of other regions that make up the Catalan countries when they decide to join) and which, after a constitutional period, would culminate in a referendum monitored by international organizations that, if passed, would imply the creation of the Catalan State in Europe. RCAT considers the mobilization of hundreds of thousands of Catalans in Barcelona this 11s2012, as the culmination of the march towards independence organized by the ANC for months, can be an act of sovereignty that opens this process that must be accompanied by the maximum possible unity of political forces whose primary objective is independence of our country in order to be together in the next parliamentary elections in Catalonia. This social majority for independence increasingly expressed and openly manifested must necessarily be accompanied by a majority in the political institutions. The correct interrelation between social and political majority is the success of the process of national liberation. We understand that at this crucial time in our country’s history, the Government in the Generalitat should stop its usual ambiguity in national matters and can no longer maintain its alliance with the Partido Popular while making calls to sovereignity most of times opportunistic and devoid of content. Catalan Society and People are mature and deserve politicians that do not hide and who lead all those who are fighting for their own state. Moreover, the independence movement must also be mature enough to ensure good governance of the country in this period of transition to our own state, and to support the government if it decides this step towards independence and ensure a majority stable enough to deal with all those who want to derail this way which will have no reverse. RCAT insists that now is not the time of partisanship, it is not the time to seek political performance in the short term, it is no time to discuss on mottos and slogans like and how should we attend the 11s2012 demonstration. While wasting time on this, the Spanish plunder continues, our infrastructure deficit is increasingly unsustainable, prosecution of our language continues, the crisis and the cuts threaten our welfare state and stifle our economic development. It is time, therefore, for great decisions, it is time for an agreement that takes our country out of the Spanish prison. This National Day is not, therefore, just another Eleventh of September. Now is the time to decide whether to remain a colony of Spain, a Spanish region, a single province without language, assimilated, without identity, without the ability to decide on their resources or if we want a presence in Europe and in the world as a free nation who has its own state. 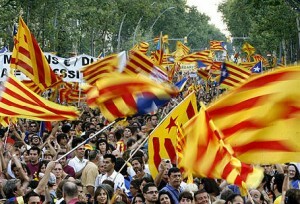 Reagrupament Independentista will stand up to this historic moment.